Wednesday afternoon, I-5 traffic was light near the Santiam Highway interchange. On Interstate 5, beware of Friday afternoons. That seems to be the most dangerous time to drive on western Oregon’s main north-south highway. Before Thanksgiving, the Oregon State Police joined the highway patrols of California and Washington in a publicity event urging drivers to be extra careful over the weekend, especially on Pacific Highway 1, another name for the interstate that links our three Pacific states. “Arrive Alive on I-5” was the catchy motto. For this occasion the OSP dug out accident statistics. 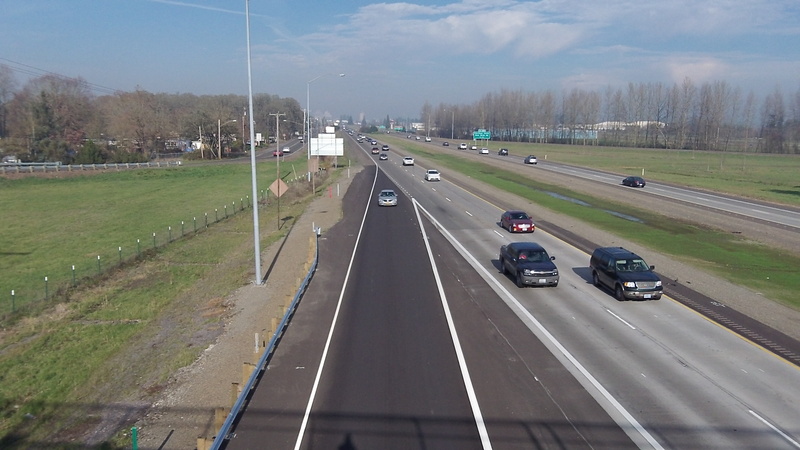 On Oregon’s segment of the road in 2012, crashes numbered an even 2,000, resulting in nine deaths and 1,427 people hurt. Of all the crashes, more than half were rear-enders, which should remind you of the wisdom of keeping far enough away from the car in front and watching your speed. And Fridays had the largest single share (361) of all 2,000 wrecks. The vast majority of all crashes happened in the afternoon, between 1 and 6 p.m., with the largest single number per hour, 228, between 5 and 6. Maybe that’s because when people get off work they are tired and impatient, and their reflexes are slowed. November, sad to say, was the worst single month for the number crashes (242) and people injured (171). Two of the nine fatalities happened in November. I wondered what you were doing on the overpass today when I saw you. Now I know. Happy Thanksgiving! So, probably a good idea I opted not to try getting a photo of the skeletal trees and ghostly farm houses rising out of the fog as I drove through your section of i5 the other day. It was truly beautiful. 18% of crashes happen on Fridays. I’d be curious to know what % of total traffic occurs on Fridays. It may not be that great of an aberration when that is factored in. Traffic counts on I-5 by day of the week are not at hand, but it stands to reason that the more traffic, the more accidents. For example, 769 or 32 percent of the 2000 crashes happened in Multnomah County, where metro traffic is presumably the heaviest. And the smallest number, just 19, occurred between 1 and 2 a.m., when we expect traffic to be the lightest.